ID Keys: Male black with white wing patch and rump, yellow belly, and thin white facial stripes. Williamson's Sapsuckers are generally found in the mountains of the western United States, and are only extremely rare visitors to South Dakota. The male and female of the species have strikingly different plumages, so much so that they were once thought to be different species. As with other sapsucker species, they drill "wells" in trees, feeding both on the sap that seeps out, and the insects attracted to the sap. 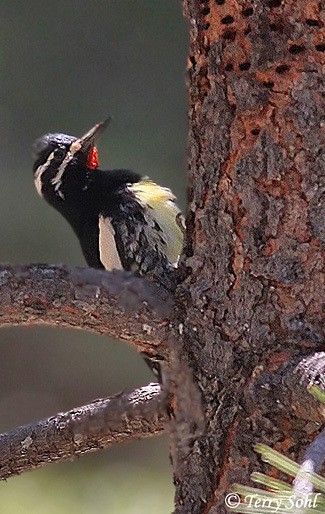 The photo to the right depicts a Williamson's Sapsucker on a pine tree with sapsucker wells shown at the top of the photo. Habitat: Found in mountainous conifer forests during the summer breeding season. Winters in lower-elevation pine and pine/oak forests. Diet: Eats many insects and tree sap, and also feeds on fruits and berries. Behavior: Drills typical sapsucker wells, taking both sap and trapped insects from the wells. Will also climb through foliage and branches in search of insects, fruits, and berries, hop along the ground in search of insects (especially ants), or occasionally fly out from a perch to catch passing insects in mid-air. Song: Usually silent, although they have a loud harsh screech similar to that of a Red-tailed Hawk's. Migration: Summers throughout the mountains of the western United States. 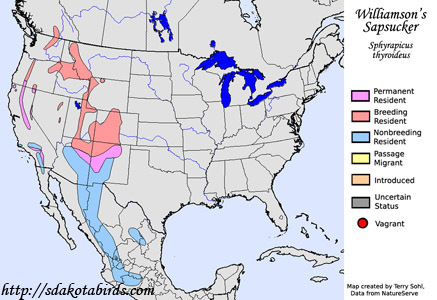 Most move southward along the Rockies for the winter, going as far as west-central Mexico. Some are semi-permanent residents, only moving to lower elevations in the winter. Bird Feeders: Will attend feeders for suet, also nectar and sugar water. Conservation Status: Numbers generally stable, they are found over a broad geographic area, and they are relatively common in parts of that range. The IUCN considers the William's Sapsucker to be a species of "least concern". South Dakota Status: The SDOU's "Birds of South Dakota" (2001) shows only one recorded instance of the species in the state, in Hughes County in 1975.